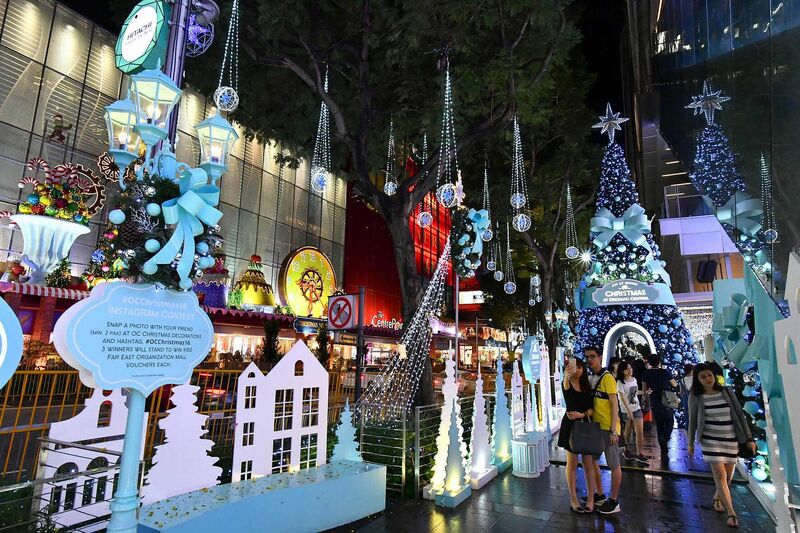 What to see: This year's annual light-up brings hues of blue, turquoise and sapphire to the popular city shopping belt. 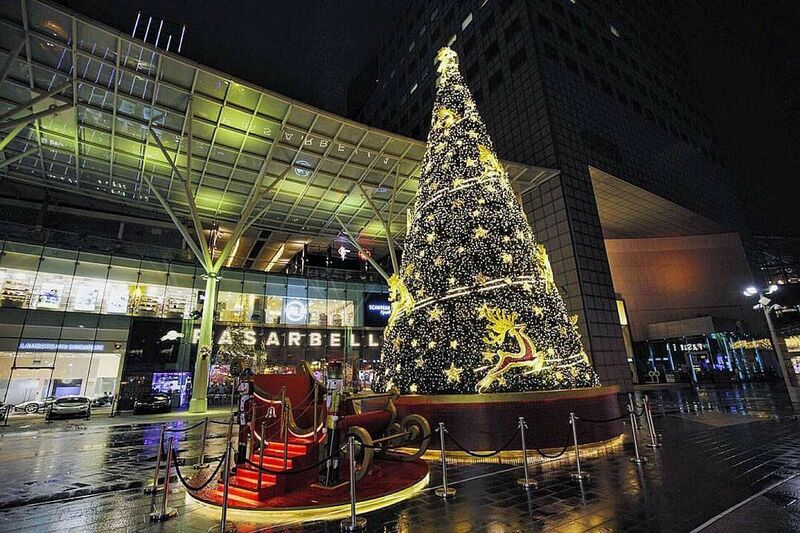 The lights, all 60,620m of them, will glitter along 2.9km from Tanglin Mall to Plaza Singapura. 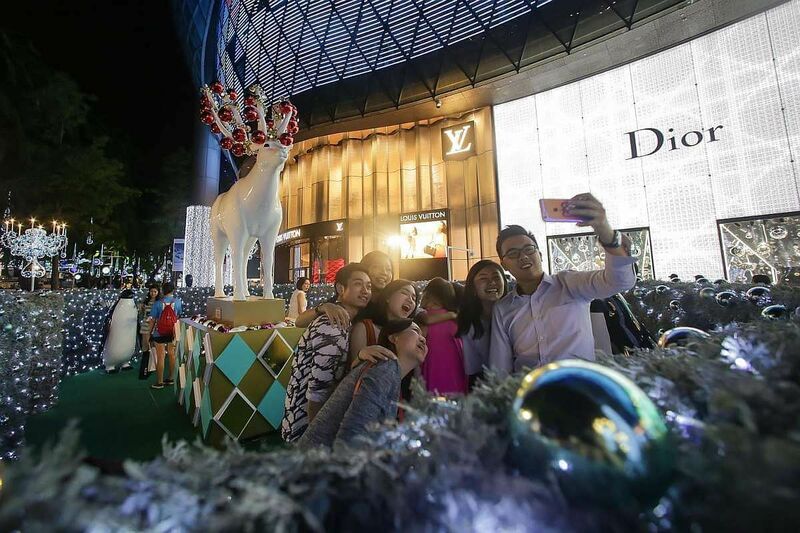 Aside from the motifs of reindeer and orbs that are lit up, seven set pieces add to the glitz of the season, including "jewels" that glow when visitors step, jump or hop on them in front of Wisma Atria mall, and a dome in front of Orchard Building that lights up when visitors walk through it. What to see: A 12m-tall outdoor Christmas tree embellished with dazzling pearl baubles and holly berries. When night falls, the tree is washed in a brilliant gold with glowing reindeers to match. What to do: Buy the perfect gift at the Marks & Spencer Christmas Pop-Up store and get a Christmas tree with a plethora of elaborate ornaments and accessories. 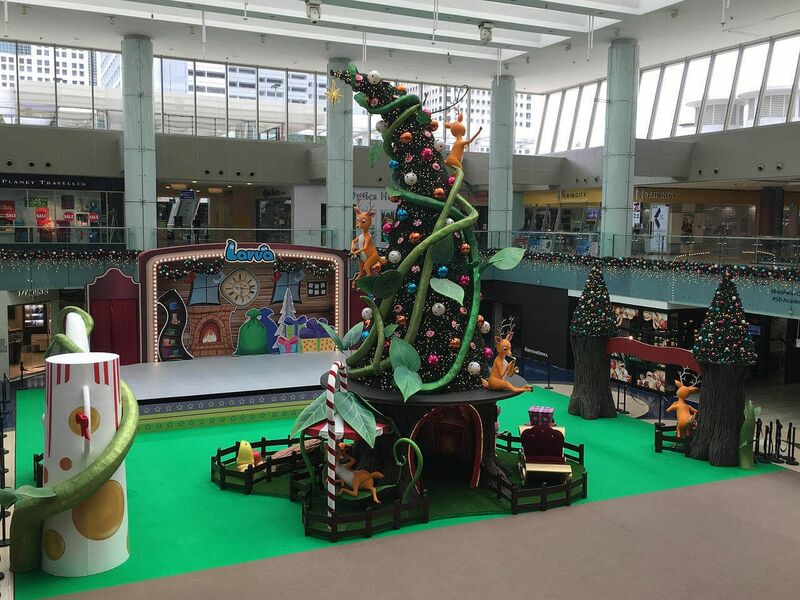 Drop by the Metro Christmas Trim Shoppe for five magical Christmas trees - a majestic collection of pre-coiled trees that extend up to 2.5m tall. 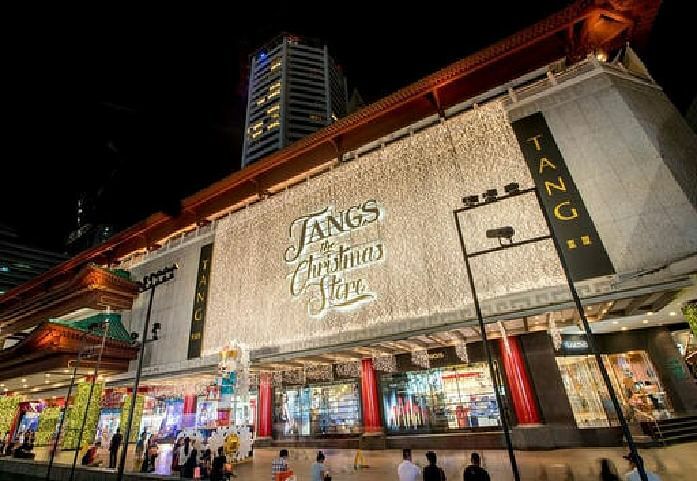 What to see: A 20m-tall outdoor Christmas tree with a "gift box" at its base, where shoppers can take photos in an interactive photo- booth with backdrops of fireworks and more. Photos can be collected for free from Tiffany & Co in the mall. Near the tree is a Christmas fantasy maze with glittering ornaments to lose yourself in. 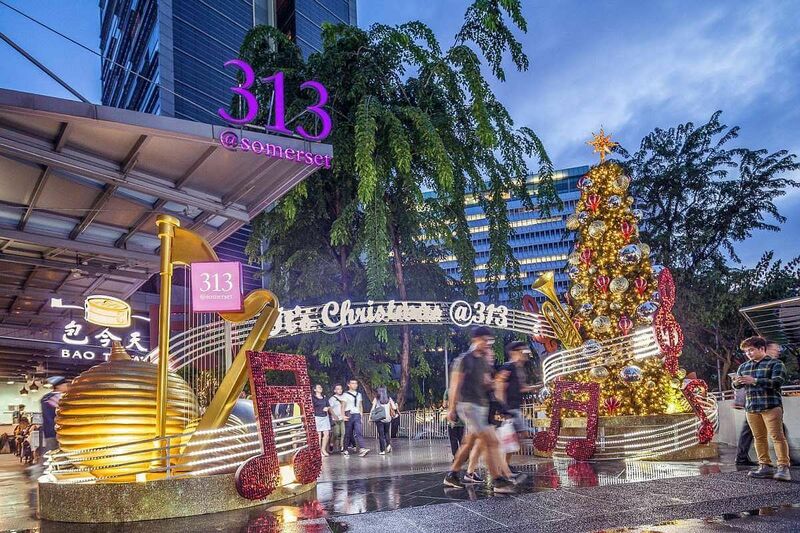 While not something to be seen, Ion Orchard also has a "holiday scent" to subtly complement its signature scent inside the mall. What to do: Look out for pop-up stores selling accessories such as bags and wallets, beauty products and other holiday gift ideas. 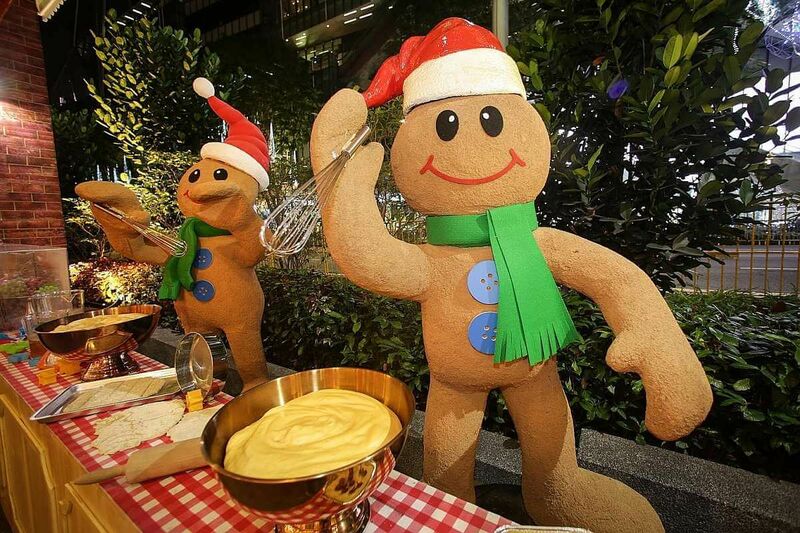 What to see: A quirky festive kitchen, manned by life-size Gingerbread Men up to their ears in frosting and cream, is the star at The Centrepoint this year. The Christmas Clockwork Kitchen comes to life every hour in a combination of vibrant colours, fantastical lights and melodies, as the Gingerbread Men hoist giant candy canes and cake pops onto a 10m-tall Christmas Tree. What to see: A plush green meadow, with golden branches and colourful, soft bellflowers blossoming above. It also has a trail of apples, berries and acorns. What to do: There is an obstacle course in the Secret Garden of Enchantment for children aged five to nine. There are also fairy tea parties on selected dates. 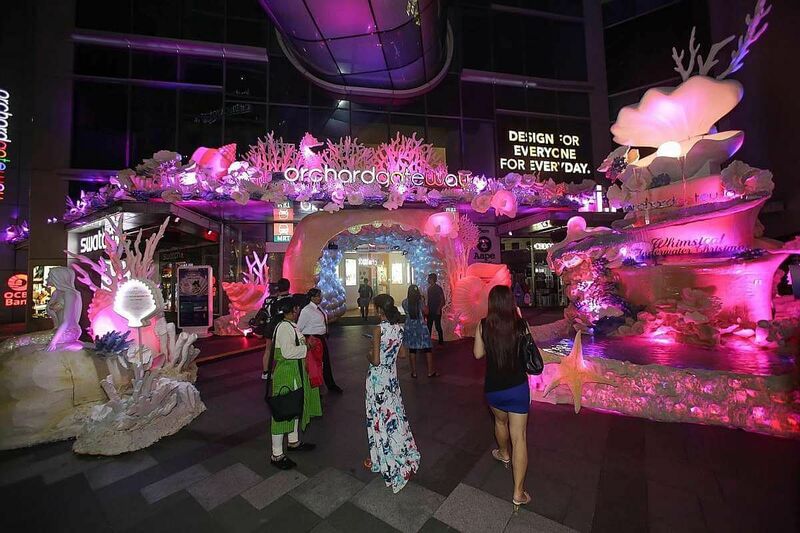 What to see: Decorations inspired by fantastical underwater worlds, with bubbles aplenty to greet shoppers. What to do: Get up close and personal with a mermaid who sings and takes photos with visitors at selected times. What to see: Music takes the stage as glitzy life-size decorative musical notes welcome visitors. What to see: Larger-than-life snowflakes, ballerina "ice sculptures" and a towering nutcracker soldier with his army standing guard throughout the department store. What to do: Children and adults can learn skills such as decorating gingerbread men, making chocolate fondue and making paper pleated Christmas wreaths at workshops. Fees range from $35 to $98. 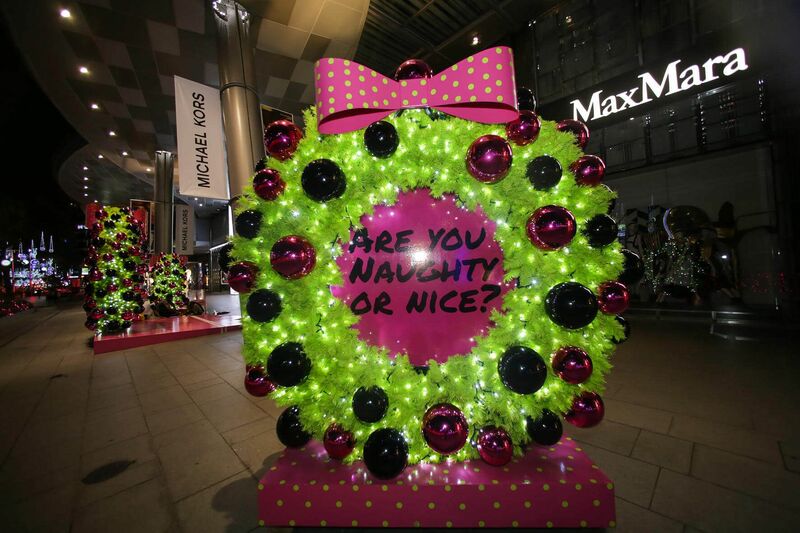 What to see: A Christmas tree in eye-catching shades of green and pink. What to do: Showcase your musical talent on six decorated pianos. 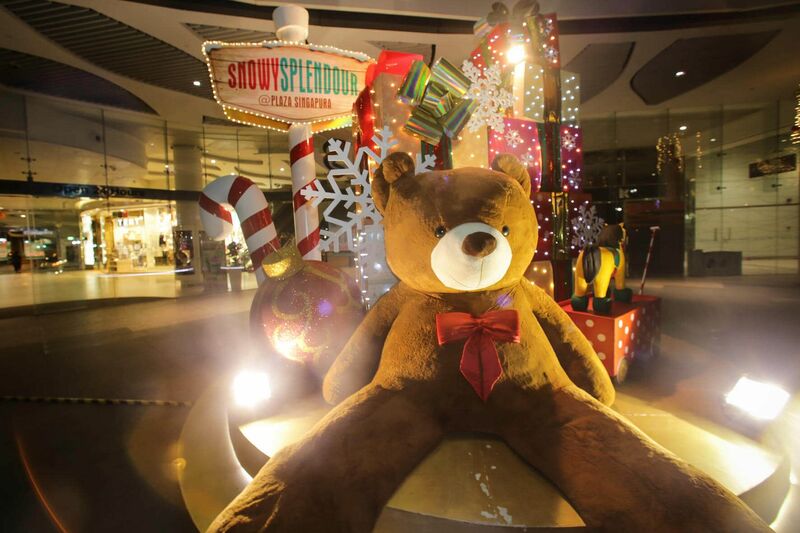 What to see: A cuddly 2m-tall teddy bear surrounded by a huge stack of gift boxes at the mall's outdoor plaza. Other children's toys decorating the mall include a rocking horse and an aeroplane. What to do: Frolic in snow at the mall's first outdoor snow playground, the Snow FunHouse, from tomorrow. Starting next weekend, tinker with liquid nitrogen and dry ice or make ice cream in free science workshops. There is also a Christmas market featuring in-house retailers such as British toy store Hamleys and clothing and food brand Marks & Spencer. What to see: A line of outdoor Christmas trees that leads visitors to the mall's entrance. Also walk through a magical forest with benches and street lights that will give visitors a whimsical welcome. 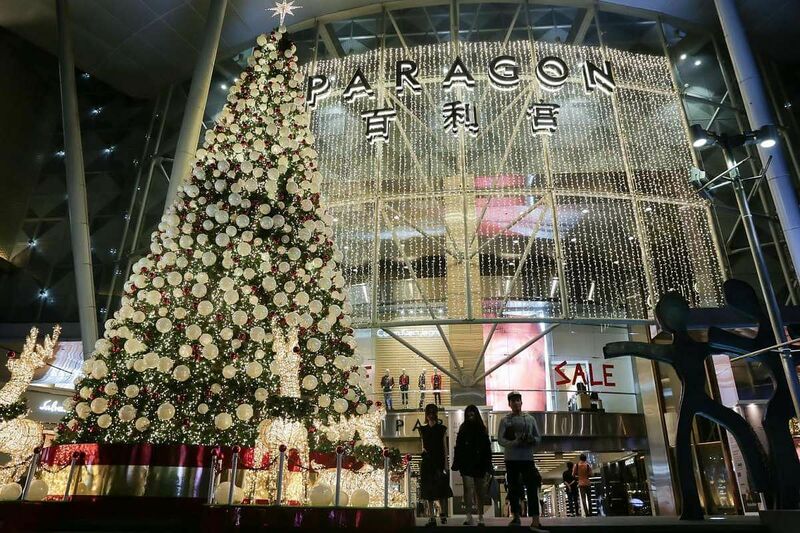 What to see: A 16m-tall Christmas tree dressed up with Christmas Bear ornaments. Shoppers will be reminded of cosy homes, love and family, as though one could smell the scent of Christmas in the air with lighted candles, cinnamon, hot cocoa, fir trees and mistletoe. 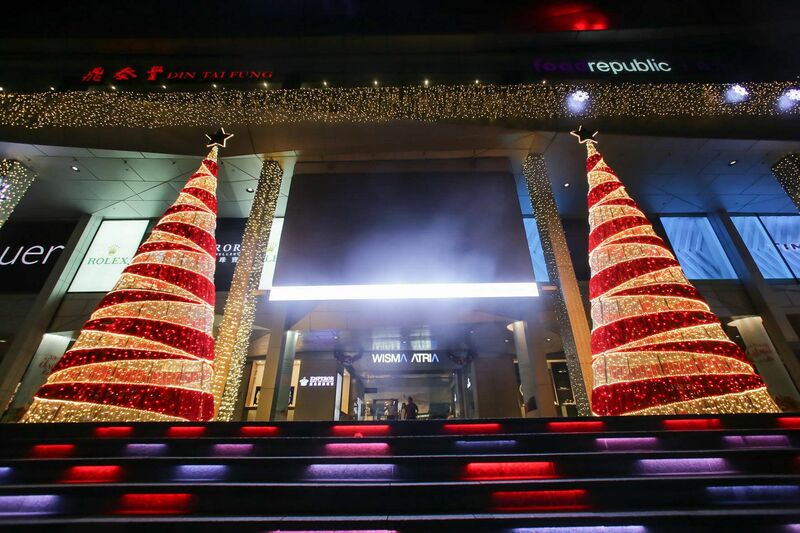 What to see: Two 5.5m-tall Christmas trees at the mall's main entrance, with a facade of "gold" when night falls. The mall's walkway is decked out with garlands of red and gold baubles. Look out for a gingerbread candy house too. 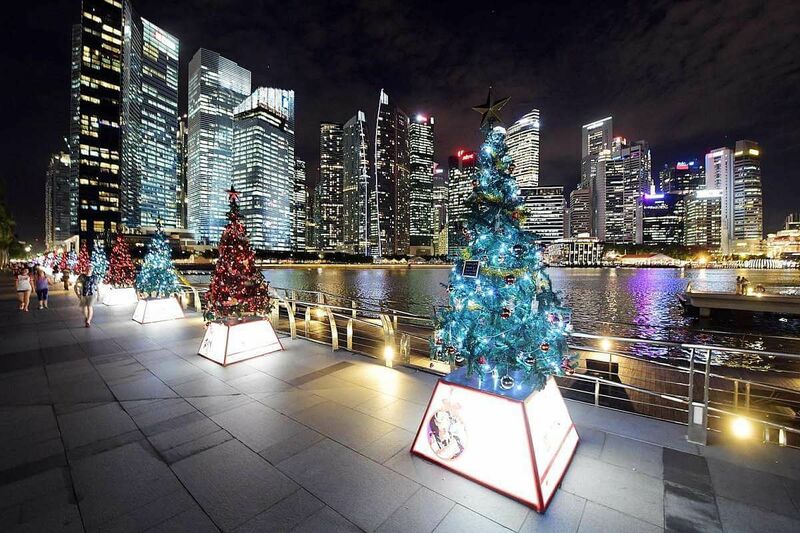 What to see: A row of 30 personalised Christmas trees, adopted and designed by corporations and some of their beneficiaries, along the Marina Bay Waterfront Promenade. They have been put up to raise funds for the disadvantaged. 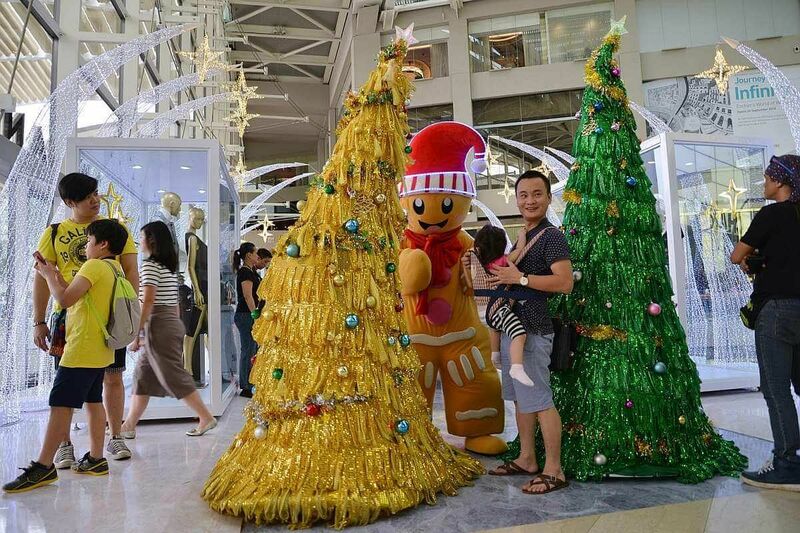 What to see: Dancing Christmas trees accompanied by a gingerbread man and two Christmas bells will roam around The Shoppes at Marina Bay Sands on weekends from 2 to 8pm, until Christmas Day. Over at the lobby at Hotel Tower 1, a 10m-tall Christmas tree is adorned with 2,000 ornaments. 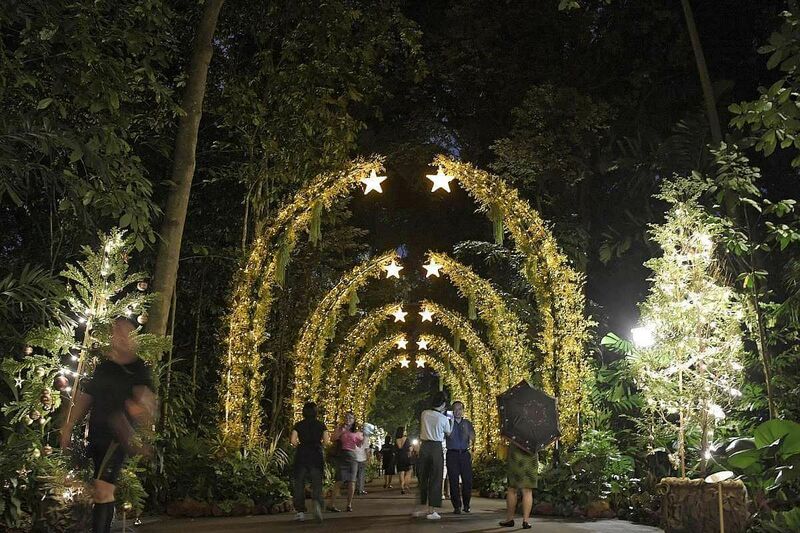 What to see: Two hundred decorated trees and other festive trimmings along a 2km path stretching from the Tanglin Gate to the Nassim Gate Visitor Centre. As part of Trees of the World, a month-long Christmas event, the trees were adopted by various organisations, schools and voluntary groups. Each tree's design has a unique spin and is decked out in fairy lights and an assortment of ornaments, from traditional baubles to quirkier items including recycled cups and spoons. Visitors can also look out for a stunning row of arches that line a path on Maranta Avenue or Santa on his sleigh surrounded by reindeer and gnomes near the Nassim Gate entrance. 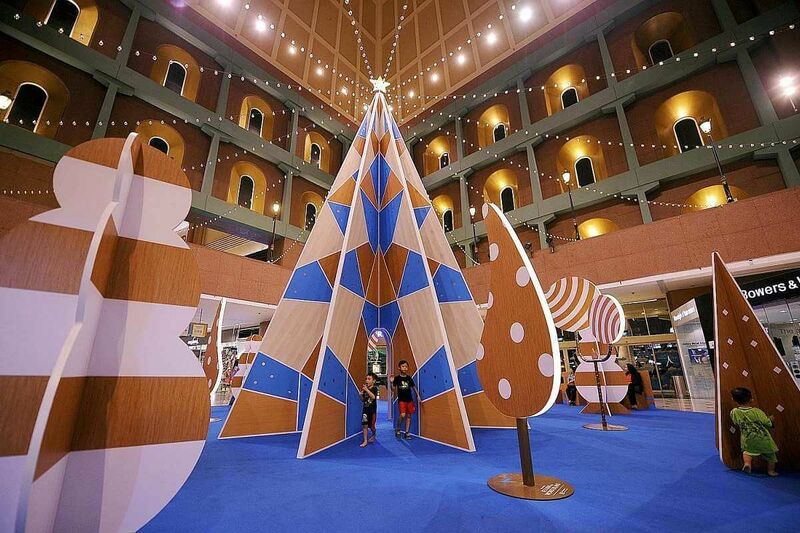 What to see: Fans of Craftholic, known for its huggable plush toys with skinny limbs, might recognise the Japanese lifestyle brand's signature motif in the mall's 15m-tall sparkling Christmas tree. Brightly coloured snowflake, dove and sock ornaments add a touch of whimsy to the tree. What to do: Alongside the tree is a Craftholic pop-up store selling a variety of products, including exclusive items. Look out for 3D-card or hairband-making workshops as well. 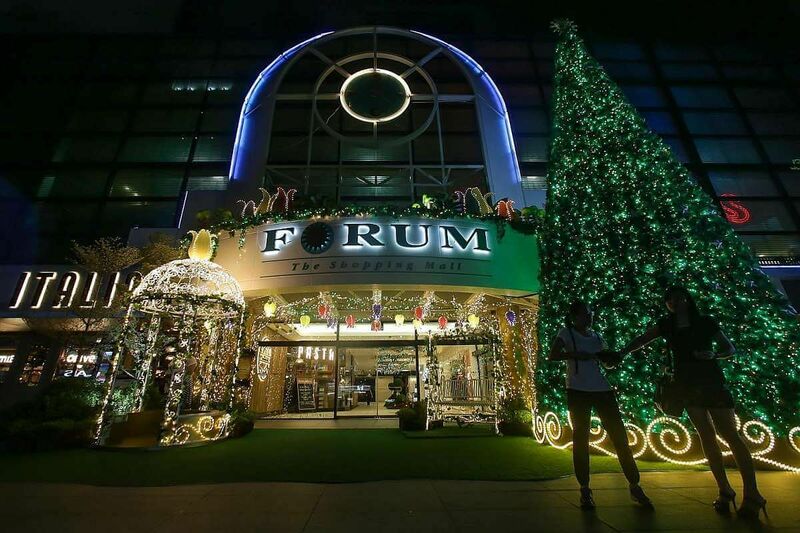 What to see: Shimmering stars and galloping reindeer decor adorn an outdoor 15m-tall tree that faces the mall's Fountain of Wealth at the street level. At the foot of the tree is a 2m-tall sleigh. Look out for a smaller tree in the Sky Garden. 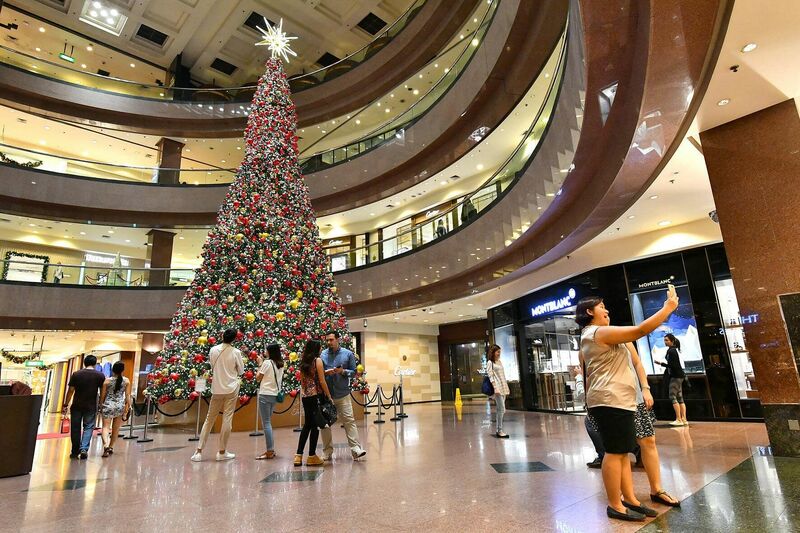 What to do: Shop at the Festive Market featuring some of the mall's tenants, such as The Singapore Mint, and external vendors like Japanese-French-inspired bakery Annabella Patisserie. 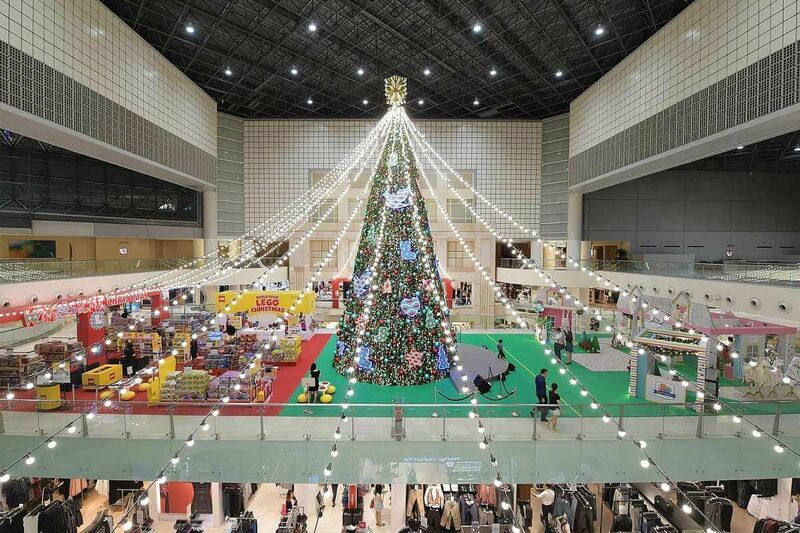 What to see: A 10m-tall Christmas tree that leans towards one side, with large candy-like baubles and reindeer hanging on it. Visitors can also step into Santa's cosy home located at the foot of the tree or try taking a spin on his sleigh. The tinsel fun continues into the outdoor roof garden with another Santa's sleigh, cute bunny sculptures and twinkling lights. What to do: Whether you are a fan of Japanese snacks or British sweets, the Christmas festive fair in the mall has them. Both Marks & Spencer and Emporium Shokuhin will be selling a mix of festive goodies and popular snacks. What to see: The ticketed Christmas Wonderland fair with exquisite handmade Luminarie, or sculptures of light, from Italy scattered across the expanded fairgrounds. The sculptures are based on 17th- and 18th-century Baroque architecture, with the largest and tallest being the 19.7m-tall Spalliera Castel del Monte at the Supertree Grove. The Yuletide fair is organised by Blue Sky Events. 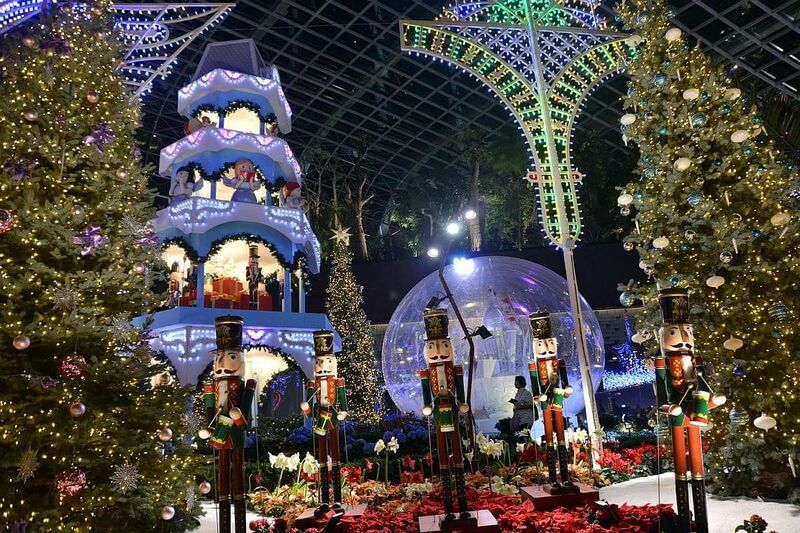 There is also the Merry Medley floral display designed by the Gardens at the ticketed Flower Dome, featuring poinsettias, amaryllis and conifer trees, alongside festive decor such as giant glass globes up to 6m in diameter. 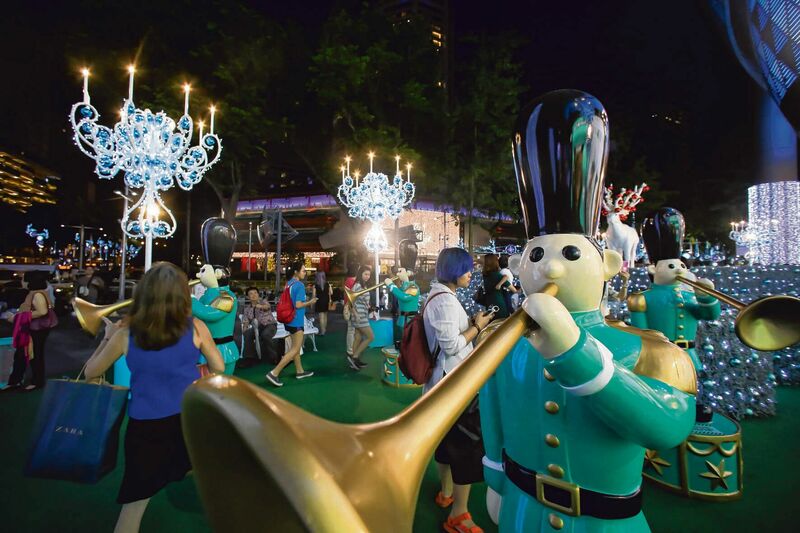 Visitors can enter an 11m-tall Christmas tower, which houses a band of toy soldiers and an angelic choir. What to do: Shop or grab a bite at the festive market, venture into a Magical Forest packed with 150 Christmas trees up to 4m tall or let Santa know what is on your gift list at his cottage. A favourite with past visitors is the ice palace, which holds a snow playground, an ice-skating rink and a 25m-long ice slide. Some activities are ticketed. What to see: The familiar needle-like leaves of a green Christmas tree have been swopped for a minimalist aesthetic featuring blue-and-brown hues and triangular panels. Children can run through an opening in the 9m-tall tree's base or play hide and seek among the smaller structures in the Christmas parkscape. What to do: The mall will have a different Christmas market each week until Christmas Day, featuring local designers and creators peddling handcrafted items such as jewellery pieces and household products. Get crafty at workshops held during the weekends, such as those for paper pleating, leather crafting and Christmas wreath-making.